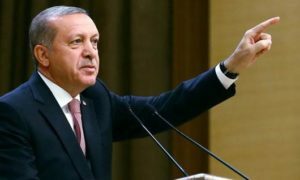 Turkish President Recep Tayyip Erdogan slammed Austria’s populist government for its decision to shutter seven mosques and expel dozens of Turkish-funded imams. “These measures taken by the Austrian prime minister are, I fear, leading the world towards a war between the cross and the crescent,” Erdogan said, according to a report by AFP. Austrian Chancellor Sebastian Kurz said the move, which he announced on June 8, was a crackdown on political Islam. The Austrian government said 60 of the 260 imams in the country are being investigated, of whom 40 belong to ATIB, an Islamic organization in Austria close to the Turkish government. “Parallel societies, political Islam and radicalization tendencies have no place in our country,” Kurz said. “They say they’re going to kick our religious men out of Austria. Do you think we will not react if you do such a thing?” Erdogan warned. “That means we’re going to have to do something,” he added without elaborating. The seven mosques being closed include the Mosque of the Grey Wolves on Antonsplatz, in the Vienna district of Favoriten. The other six mosques are in Vienna, Upper Austria and Carinthia, in all of which hardline salafist teachings are reportedly widespread.